Economist Piketty's Work Doesn't Add Up, 'Financial Times' Says : The Two-Way The U.K.-based newspaper says the author of Capital in the Twenty-First Century, a treatise on income inequality, may have gotten some of his data wrong. 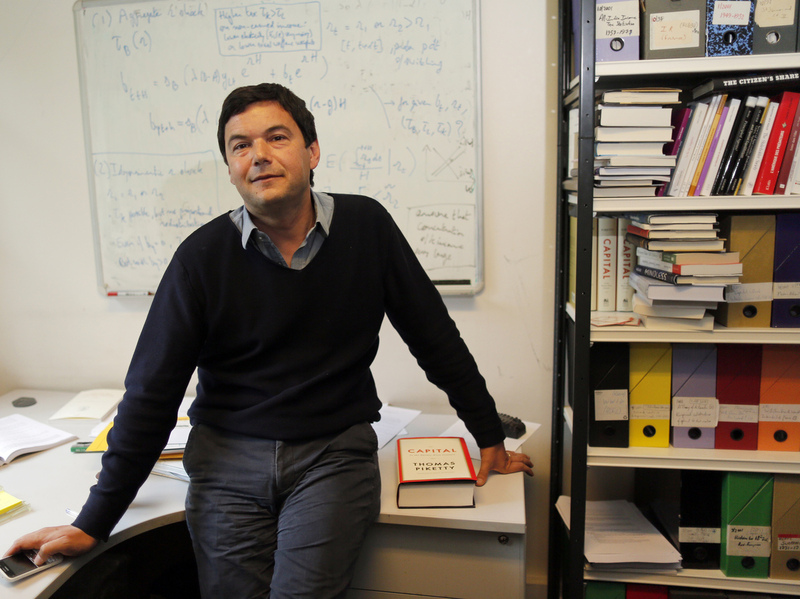 French economist and academic Thomas Piketty, in his book-lined office at the French School for Advanced Studies in the Social Sciences, in Paris, earlier this month. French economist Thomas Piketty became a publishing superstar this year by putting two and two together and concluding that the rich are getting richer. His best-seller, Capital in the Twenty-First Century, uses mountains of data to calculate Western wealth over the past two centuries. He says the historical statistics, drawn from many sources, show unrestrained capitalism inevitably leads to immense income inequality. But on Friday, The Financial Times, a respected British newspaper, said it has reviewed the book's data. And it finds Piketty "got his sums wrong." Chris Giles, the newspaper's economics editor in London, writes: "The data underpinning Professor Piketty's 577-page tome, which has dominated best-seller lists in recent weeks, contain a series of errors that skew his findings. ... There are transcription errors from the original sources and incorrect formulas. It also appears that some of the data are cherry-picked or constructed without an original source." And the story quotes Piketty's response: "I have no doubt that my historical data series can be improved and will be improved in the future ... but I would be very surprised if any of the substantive conclusion about the long-run evolution of wealth distributions was much affected by these improvements," Piketty said. And with that, we launch a thousand Ph.D. dissertations as young economists scramble to sort out who is right about the data's accuracy and import.